How to Easily Master Format HTC 8S Windows Phone with Safe Hard Reset ? Solutions for HTC 8S Windows Phone problems. This is some other product from HTC with Windows Phone 8 operating system. Good news for HTC 8S user because this smartphone can be upgrade the operating system Windows Amber. Choosing HTC 8S because the body design is good and have dual-core processor with 512MB ram, enough to run applications at Windows Phone 8 without problem. HTC 8S have 4 inches LCD screen and have 5 megapixel camera. With better price, the Windows Phone HTC 8S is good to have for daily usage. What is main specifications HTC 8S Windows Phone? How to Fix or Problem Solving for Recovery HTC 8S hang or not responding or malfunctions or stuck or freezing or bricked ? HTC 8S have dual core processor with 1Ghz speed and have 512MB RAM, it mean using this smartphone will not get problem to run applications which downloaded from Microsoft Marketplace. Applications like games, entertainment and office work also available to download free or need to be purchase. The problem is, some applications is not compatible with HTC 8S and sometime can make problem like hang or frozen or stuck or lcd touch screen not responding or bricks. First we have to try doing soft reset or restart or reboot HTC 8S to removed and delete temporary files and cache that can make the phone got problem. If the problem still happen then we need to do master format or hard reset. How to Soft Reset or Reboot or Restart HTC 8S Windows Phone ? The battery of HTC 8S is non removable, that is why we can not remove the battery HTC 8S for soft reset or restart. What you can do for soft reset is pressing Power Button for several second and choose to restart / reboot the phone for finishing soft reset process. Do not worry about the data, because all important data still safe while doing soft reset. If you see ‘slide down to power of‘, do slide the phone then it will turn off. The HTC 8S Windows Phone will do hard reset with master format. How to Restore and Reinstall Clean Windows Phone Operating system / firmware at HTC 8S ? Using HTC 8S with Microsoft Windows Phone as operating system have similar problem with computer PC. Some situations we need to do reinstall the operating system with clean and factory setting default one. Usually this situation happen because the current operating system already damage or broken. Doing reinstall or restore the clean operating system at HTC 8S is easy for anyone, because the file source of clean and factory default operating system already saved inside this phone. Follow the step for hard reset above will make the operating system or firmware will be reinstall or restore by itself. How to Unlock or Fix or Bypass or Solutions for HTC 8S Windows Phone forgot password code or security lock screen pattern or pin? We can give password for security protection, but we need to be careful when give that security protection at our HTC 8S Windows Phone, better you note the password in safe locations. If you forgot about the answer of security password, the you need to do hard reset with hardware button above. How to Improve Performance HTC 8S to make run more faster? When we use HTC 8S for daily usage, this smartphone already have good performance. But some user maybe have bad experience because the HTC 8S become run more slowly then before. Usually this problem happen because there are too many applications that run together in the background. Please try to reduce and uninstall the installed applications to make if run more faster. If we need to make HTC 8S performance faster like new, then we need to do hard reset or master format. How Can I add More Internal Memory Capacity Space at HTC 8S ? Actually the HTC 8S Windows Phone have total 4GB internal memory. By default we can not add more capacity , but this phone have external storage slot which can be add up to 32GB. We are really recommended the HTC 8S user to save images, move, music or any other downloaded files into external storage to make the internal capacity still enough to install some more applications from Microsoft Marketplace. Can I Update HTC 8S Windows Phone Operating System or Firmware ? Yes you can, HTC 8S with Windows Phone 8 operating system have ability to upgrade the firmware. If the update available for HTC 8S, then you can continue download and follow the step to update the HTC 8S Windows Phone firmware or operating system. Please remember for HTC 8S users, the operating system usually will not get problem if we only run native and safe applications. But in some situations, native applications not always safe when you connected to Internet and download something that we never know or not sure about it. Doing hard reset or master format is the last option if our HTC 8S can not back to normal. Doing hard reset or master format will make all important data or installed applications removed from this smartphone. Please backup all important data before performing hard reset. 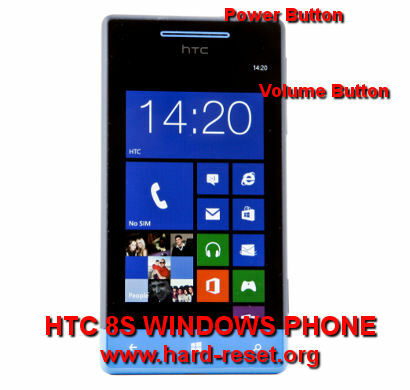 The information from this page describe about htc 8s hard reset. If you need another resource for hard reset, use search function at this homepage or find from our related posts. How to Easily Master Format OPPO F1 with Safety Hard Reset?